Being on a ketogenic diet usually means that you’re missing some kind of crunch in your meals. Whether it’s meat and vegetables, a dessert, or just a snack – it’s notorious for being something textually soft. 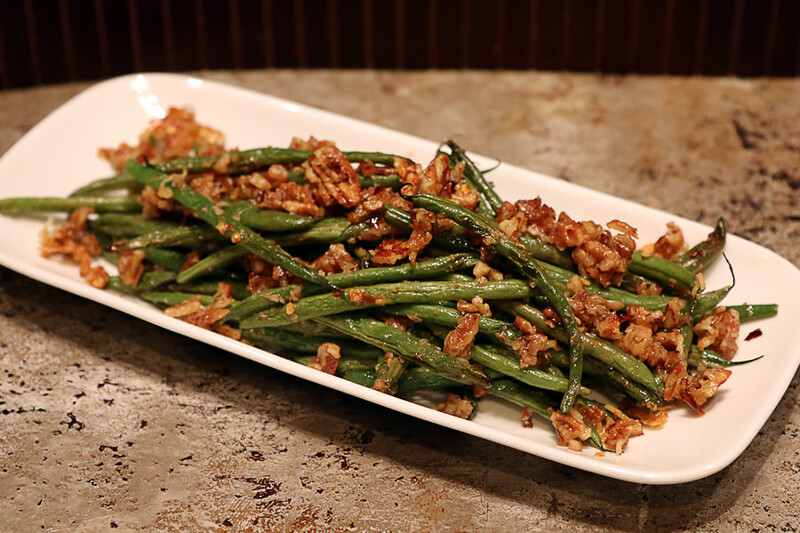 These roasted pecan green beans will give you a great pick-me-up from the old and dated recipes that you’re used to. 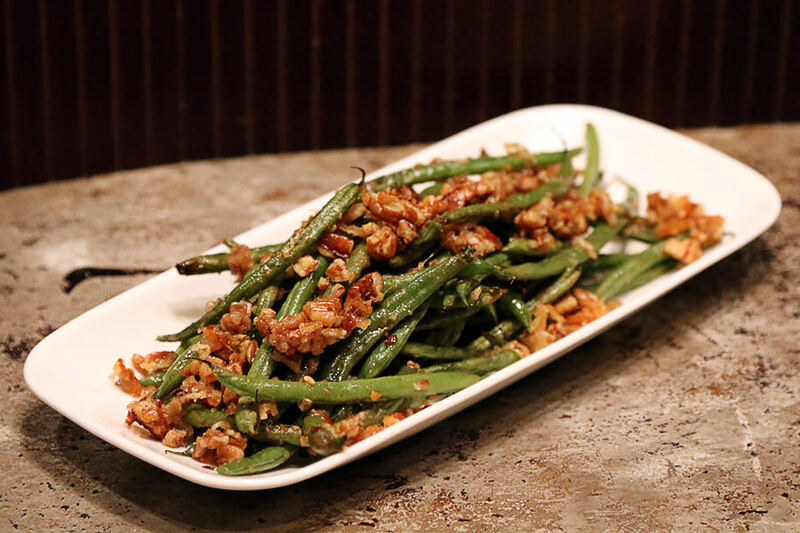 The crisp and fresh green beans, the deliciously crunchy and salty pecans, and the melted cheese and garlic give a fantastic textural contrast. Not only is the texture fantastic, but this flavor explosion will have your mouth watering every time you make them. Roasting green beans doesn’t usually happen all that much in my house, but when it does – everyone is happy about it. You MUST use dry green beans, though. You want to get rid of any excess moisture on them so they will stay nice and crisp as they cook in the oven. 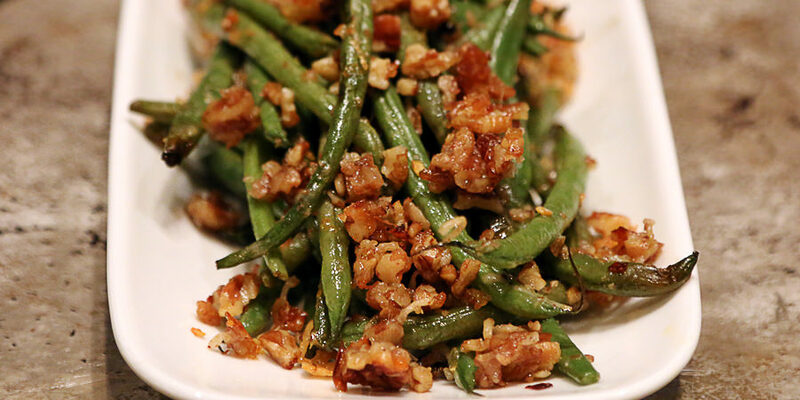 The savory notes of the olive oil add flavor, but also allow for the green beans to roast properly (without burning). The earthy and nutty flavors of the pecans have always been a delicious combination with vegetables, and if you’ve never tried it before, then you’re in for a real treat! Not to mention the lemon and red pepper flakes adding just enough of a fresh acidic note and slight spicy note. I had originally made these to serve with the recipe I posted yesterday, the London Broil – which worked very well together. But, you can pretty much pair these with any meat and they’ll taste great! If you try them (and I am really urging you to), let me know what you think! 1. 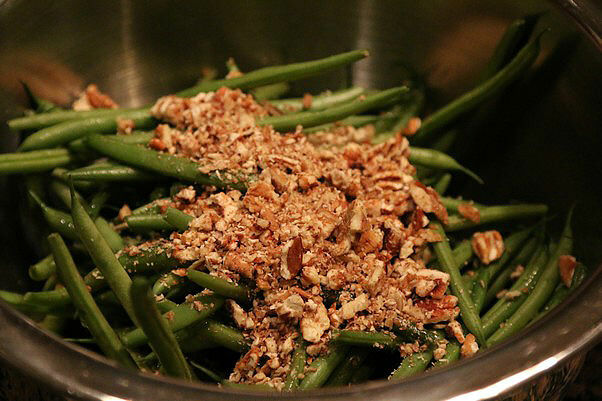 Preheat your oven to 450F, then empty your green beans into a large mixing bowl. 2. Add 1/4 Cup Pecans into a food processor. If you don’t have a food processor, I highly recommend getting one – I use this one, that’s $30. 3. 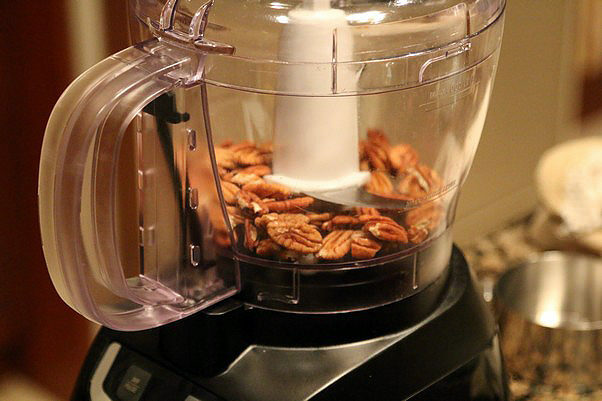 Grind the pecans in the food processor until your desired consistency is reached. Some pieces should be small and crumbly, others should be larger – adding contrasting textures. 4. Add 1/4 Cup Olive Oil, 1/4 Cup Parmesan Cheese, the Zest of 1 Lemon, 2 tsp. Minced Garlic, and 1 tsp. Red Pepper Flakes to the green beans. 5. 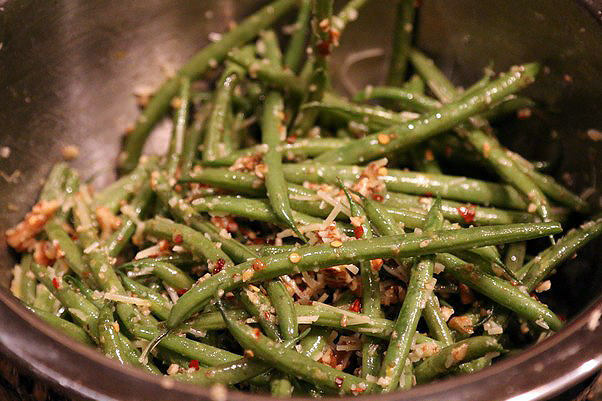 Using a fork (or better yet, your hands), mix together the green beans and the rest of the ingredients. 6. 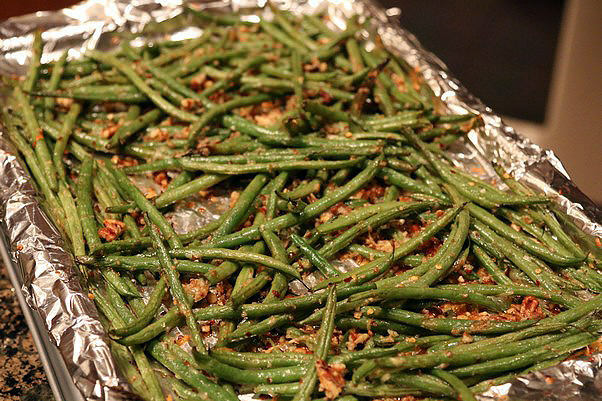 Add foil to a baking sheet, then spread your green beans onto the baking sheet. Don’t worry if some are sitting on top of the others, it will give more textural contrast throughout the whole dish. 7. 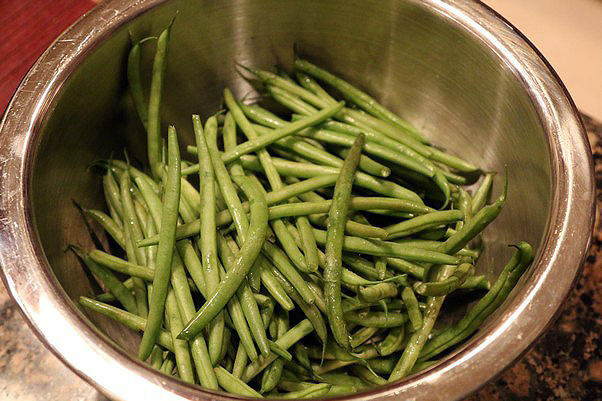 Roast the green beans for 20-25 minutes (depending on how your oven is). Make sure you keep an eye on them after the 20 minute mark. 8. Let cool for 4-5 minutes and then serve! This makes 4 total servings, each serving being 336.29 Calories, 24.68g Fats, 6.28g Net Carbs, and 4.93g Protein. Preheat oven to 450F, then add 1/4 Cup Pecans to your food processor. Grind the pecans in the food processor until they are chopped nicely. Some pieces should be large, some small. 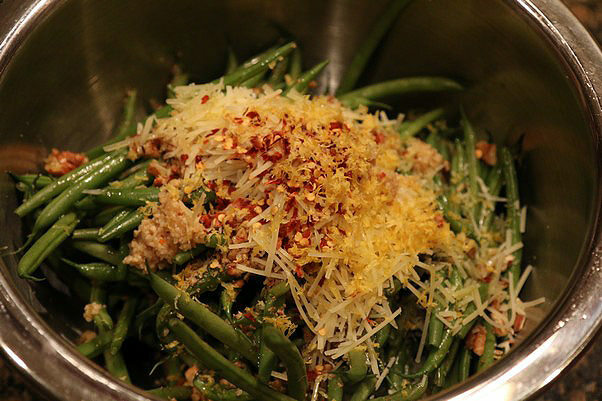 In a large mixing bowl, mix together green beans, pecans, olive oil, parmesan cheese, the zest of 1 lemon, minced garlic, and red pepper flakes. 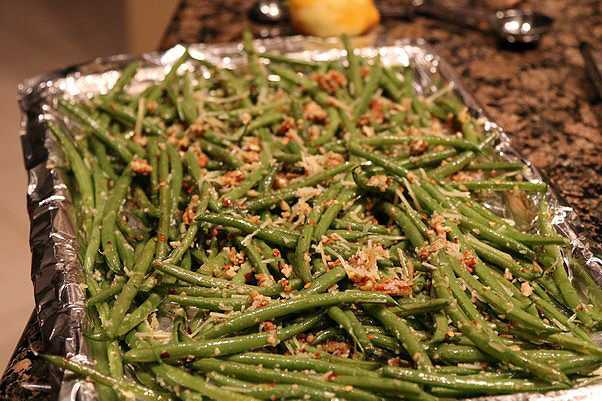 Spread out the green beans on a foiled baking sheet. Roast the green beans in the oven for 20-25 minutes. Let cool for 4-5 minutes, then serve!